It was akin to a throwback to the days in League 1. The visiting team had come to “park the bus” and rely on long balls and set pieces as their outlet for threatening the Wigan goal. The previous home games against Sheffield Wednesday and Nottingham Forest had been so entertaining. This one was much less so. Warne summed up the first half well and the Millers certainly threatened in the closing stages with their aerial bombardment, but the Latics defence held firm. 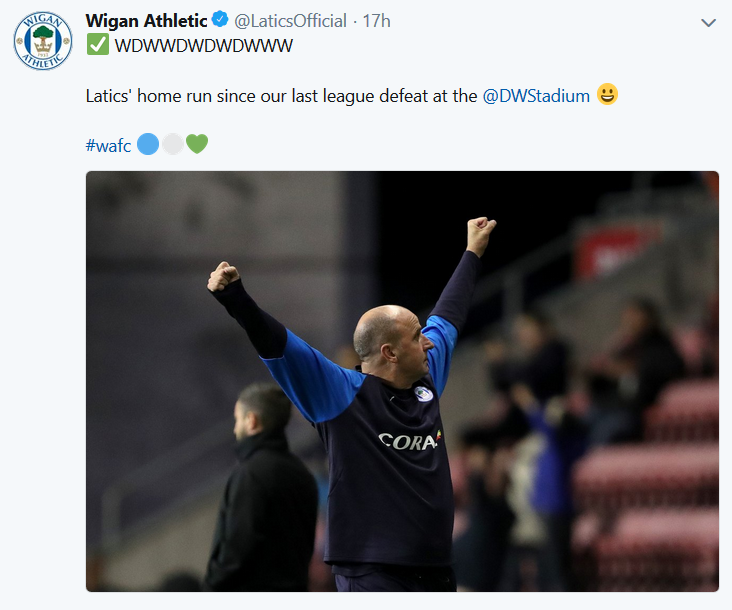 Wigan fans might debate Warne’s assertion that Rotherham were the better of the two sides in the second half, using their “direct” approach. It was not pretty to watch but caused some worrying moments for the home crowd. A refreshing aspect of Paul Cook’s tenure as Latics manager has been in the balanced starting line-ups he has selected. It has been like a breath of fresh air for Latics fans who had to endure the Warren Joyce playing four holding midfielders across the middle of the park. Cook has placed an emphasis on playing the ball wide, with the full backs bombing forward to link up with speedy wingers. However, yesterday Cook chose to play without an orthodox right winger although he had both Nathan Byrne and Callum McManaman available. Perhaps he felt that Callum Connolly deserved another run-out and the Everton player certainly reinforced the midfield. But there was not the same degree of pace on the right-hand side as a result. On the left Josh Windass is in the process of adapting to the role that Michael Jacobs has played over the past year. Windass did not play at all badly and provided the pass to McManaman that led to Wigan’s goal. He also showed his ability on set pieces with a fizzler of a free kick in the first half which sent narrowly wide. Cook will be expecting that Windass’ shooting ability will add an extra dimension to Wigan’s play. However, yesterday Wigan lacked the kind of creativity on the left that Jacobs can provide. Will Grigg and Nick Powell were taken off after 60 minutes, with James Vaughan and Callum McManaman replacing them. The result was a deterioration in the level of Wigan’s football, with hopeful punts gradually becoming the norm rather than the controlled passing game we had seen up to that point. Powell is the pivot in midfield through which so much of Latics’ best football flows. As the second half progressed Latics just could not hold on to the ball, putting undue pressure on the defence. Vaughan’s arrival once more coincided with more long balls. One wonders if the players are playing under orders to launch them towards Vaughan, or whether it is the player’s willingness to chase seemingly lost causes that affects the style of play. Or is it simply that in the final third of the game the players tire and just cannot keep that passing game going? Christian Walton continues to grow in confidence, after looking nervy in the opening games. Yesterday he looked the most composed player on the pitch, excellent in his anticipation of opposition breakaways, reliable in his box. So many Championship teams are dangerous from set pieces. League 1 teams certainly had tall players who could threaten in the air, but in the second tier the delivery is superior. Following Wigan’s goal, the Millers brought on Kyle Vassell (6 ft) and Jamie Proctor (6 ft 2 in) to join the 6 ft 4 in centre forward Michael Smith. The Wigan defence looked distinctly wobbly in the past quarter facing an aerial bombardment. It was not helped by the concession of unnecessary fouls giving the visitors the opportunity to launch dangerous crosses. It was a relief for Wigan Athletic supporters for the loan transfer deadline to pass without the departure of Nick Powell. The next step is for the club to negotiate a new contract for a player whose market will soar if he continues to stay fit. Reports suggest that the prospective new owners were present at the DW Stadium yesterday. Will the takeover actually happen soon? Nathan Byrne, Gavin Massey, Shaun MacDonald, Sam Morsy and James Vaughan are in the same position as Powell, with their current contracts expiring in summer. It will be interesting to see how many of them are offered contract extensions. Queens Park Rangers are so-called because when they were formed in 1886 most of their players came from Queens Park, which is some three miles away from where they currently play. Loftus Road is situated in the buzzing, multi-ethnic White City area of Shepherd’s Bush. It is a fascinating place to visit, with lots of sporting history, the old White City Stadium having hosted the 1908 Olympics and a match in the 1966 World Cup. Some three weeks ago, on the train traveling to Wigan for the first game of the season I was talking to some QPR supporters on their way to Preston. They said it was going to be a tough season for their club and that they would be happy to avoid relegation. They also told me that the view from the elevated tier of the visitors end at Loftus Road is as good as any at the ground. They were right on both counts. The view was as good as I can remember from an away end, being so close to the pitch. QPR looked a struggling team yesterday, barely able to pass the ball with any degree of fluency. But they got a break from a goal that should not have been allowed and they played with determination and with a well organised defence. It was enough to see off a somewhat lacklustre Wigan Athletic team. In midweek Latics had extended their undefeated run against Stoke City to nine games with a stunning 3-0 win. So often in a match preview a journalist will refer to the history of matches between the two clubs. Many would argue that past history is irrelevant to the current day. In this case an on-form Wigan were facing a pointless QPR, fresh from a 3-0 midweek drubbing by Bristol City at Loftus Road. The last time Latics won at Loftus Road was in March 2003 in a Division 2 (fourth tier) confrontation. Nathan Ellington scored the only goal of the game in the 47th minute to extend Wigan’s lead at the top of the table. But yesterday’s result means that Wigan have lost 6 and drawn one of their last 7 visits to Loftus Road. They have won only 2 of their 16 home and away encounters with the West London club. In the event he made only two changes, resting the 18-year-old Reece James, bringing back Nathan Byrne, replacing the injured Michael Jacobs with Josh Windass. Should he have made more changes after two demanding games in just over a week? Yesterday’s performance was by no means a bad one. The defence looked strong enough to deal with what the home team could muster, and the midfield play was neat enough, if the wingers did not make such an impact. When Gavin Massey limped off after 31 minutes most of us expected Callum McManaman to come on, but instead James was introduced with Byrne moving to the right wing. James made an uncharacteristically hesitant start but improved as the game went on. On the left side of Wigan’s attack Antonee Robinson was not showing the kind of spark that we know he is capable of, with Windass tucking inside. Cook was able to give James a rest – at least for the first third of the game – because he had an experienced and capable specialist right back to replace the Chelsea youngster. He did not have that option on the left. Playing with a right footed left winger Cook’s system relies on a left footed full back to provide variety. Kal Naismith was tried there in pre-season but struggles defensively. Callum Connolly can certainly play there, having done that for Everton U23s when Jonjoe Kenny would occupy the right back position. Connolly is a fine young player and Cook will most likely use him sometimes in the left back position. But with Connolly being right footed the balance could only be retained by playing a left footer like Naismith or Gary Roberts on the left wing. 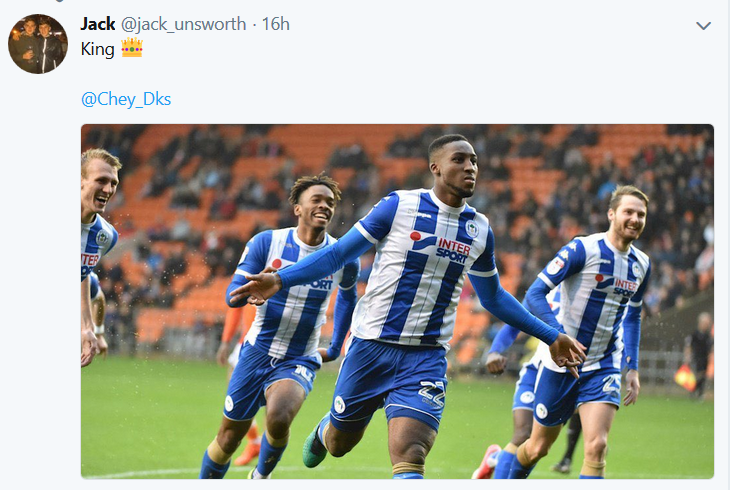 Whether Latics would have done better if Cook had rested more weary legs, both during the latter part of the game at Stoke and in yesterday’s game, is academic. But the manager was more able to stick with his low rotation formula in League 1 where the combined mental and physical load is less demanding than in the Championship. Moreover, he faces dealing with disenchanted players in his squad if he does not rotate more. Lee Evans was excellent again yesterday, solid in defence and a force going forward. Moreover, his quality delivery from set-pieces threatened the home defence. It was a pity that Chey Dunkley could not put away another of Evans’ sumptuous deliveries in the closing minutes. Bringing back Evans to the club could prove to be the best piece of business the club did over summer. While the Latics were playing at QPR, Barcelona were winning 1-0 at Valladolid until the home team had thought they had equalised in stoppage time. But as in all the major European football leagues bar two (the English Premier League and Championship), La Liga uses VAR. In this case the video assistant referee ruled that the goal had come from an offside position. Were VAR to have been used last weekend at the DW Stadium, Cash’s 89th minute dive would surely not have resulted in a penalty. Moreover, the follow up by the encroaching Soudani to Walton’s save from the spot-kick would have been spotted. The blatant push on Dunkley yesterday, leading to Hamed’s goal would also have been picked up by VAR. VAR will most likely be introduced in England’s top two tiers next season. In the meantime, there will be those that argue that major refereeing decisions, for and against a team, balance out over the course of a season. Judging by the balance of the major decisions made during Wigan’s eight seasons in the Premier League does this really hold true? One doubts that. Too often the balance of refereeing decisions have been unduly influenced by bigger clubs which have more “clout”, at the expense of smaller clubs. Moreover, with VAR referees can feel under greater scrutiny. 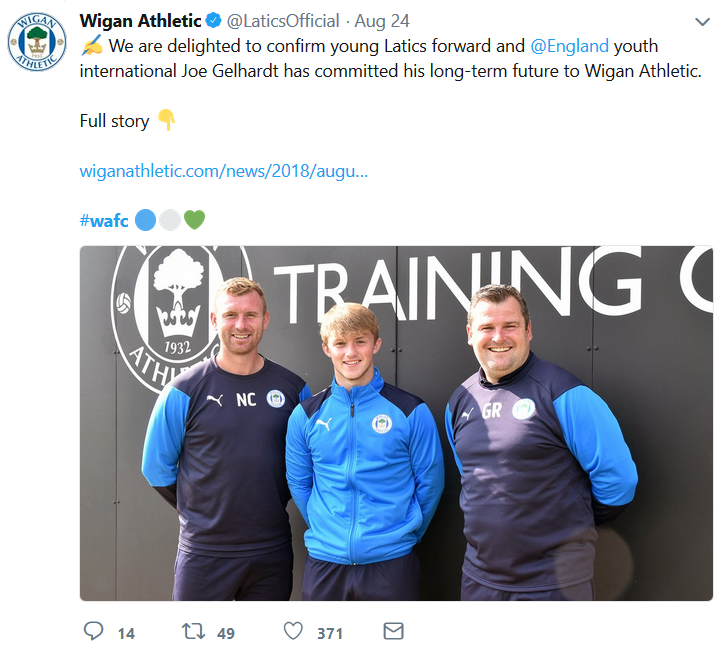 The 16-year-old had been linked with possible moves to Everton, Liverpool and Manchester United, before signing a 3-year professional contract for Latics in midweek. Following the contract extension for the 19-year-old Callum Lang, this is another welcome move by the club. However, with the loan transfer window still one for another five days we await news on the permanence of key players in the senior squad, whose contracts expire in June 2019.